This premium, 100% pure Minera Dead Sea Salt has not been bleached, refined or mineral depleted. Certified 100% authentic, pure and natural they are the same salts as used in spas and treatment centres on the Dead Sea in Israel. Dead Sea Salt includes essential minerals such as Magnesium, Bromide, Iodine, Potassium, Sulphurs, Calcium, Sodium and Zinc and many more. Adding Dead Sea Salts to your bath helps to soothe and cleanse the skin while relieving tired and sore muscles. The high concentration of minerals in the Dead Sea is what gives Minera Dead Sea salts their unique scent. Actually, the best way to tell you have pure Dead Sea salts is from their strong mineral scent. The small inorganic specs you may see are natural earth elements that like the mineral scent, are characteristics of genuine Dead Sea Salts and a good way to tell you are receiving Dead Sea Salts as nature intended them to be. 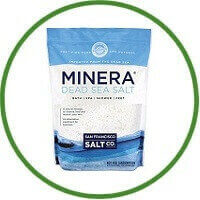 Minera® Dead Sea Salt has NOT been mineral depleted or blended with other salts as many “Dead Sea Salts” sold on the market today. This is the safe, natural alternative to treating skin conditions. According to published studies, about 80%-90% of psoriasis patients visiting the Dead Sea for treatment, experience significant improvement of their skin. Dead Sea Salt’s unique mineral composition gives this salt its therapeutic qualities for skin care. While most sea salts are primarily Sodium Chloride; Dead Sea Salt is comprised of 21 beneficial minerals including: Magnesium, Potassium, Calcium, Bromide and Sulphur. The San Francisco Bath Salt Company is confident that you will be happy with the quality of our products and stand behind every single item. If you are not satisfied with your purchase return the product for a full refund.